Two weeks ago I posted about the Annapolis show. Reports are that the Annapolis Sailboat Show was excellent. Just finished is also the power show in Annapolis October 13-16. Next up is the 2011 Fort Lauderdale International Boat Show from October 27 to the 31st. FLIBS is the most impressive show featuring the largest and most expensive yachts both power and sail of any US show. 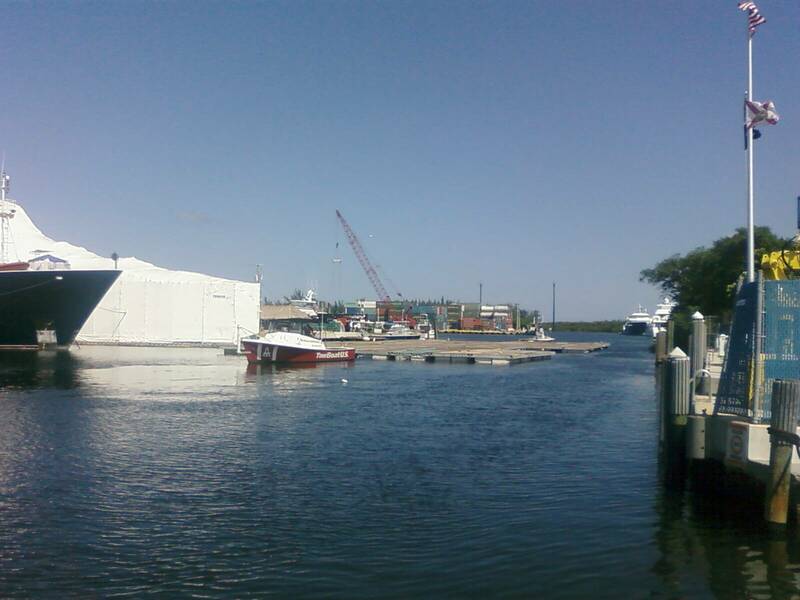 Preparations are well underway with the floating docks being assembled across from our office on the Dania Cut-off canal and towed up the Intracoastal. The floating docks run from Bahia Mar north to Las Olas Marina lined with the latest and greatest megayachts. Also in progress are innumerable brokerage open houses, crew networking events, and advertising preparations. At the beach last Friday, I noted a helicopter photoshoot of a large sportfish yacht and an equally impressive megayacht hanging out offshore in preparation to enter Port Everglades. The yachts and people flood in prior to the show and the local service groups make the most of the opportunity. It is a good time of year to see far flung friends, obtain free food, and learn about new products irregardless of whether you go to the show or not. 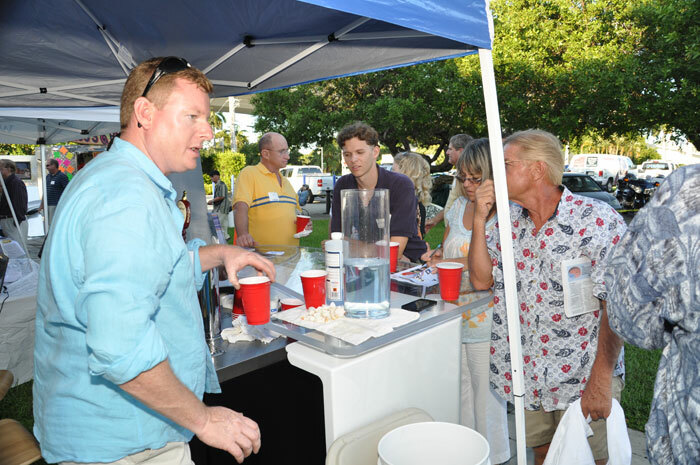 Last week there was a Hall of Fame Marina brokerage open house on Monday and a Triton crew networking event Wednesday. Tonight is a “Boat Show Night Out” at Esplanade Park (400 SW Second St.) in downtown Fort Lauderdale. In fact a post-climax to the show will be the November opening of West Marine’s new giant superstore on SR84. Yours truly chatting with Barnacle Buster guys at the Sails. There was free beer. We may not have much of Mother nature’s seasons in South Florida, but when you combine the slight cooling off of the weather and the influx in snow birds with these FLIBS seasonal events, it sure feels like a new season to longtime locals like me and gets me in the Autumn spirit. If you will be town and participating in any events, please feel to contact me whether on business, for local knowledge, or elsewise. Hope to see you around. See Triton’s full list of events for more Fort Lauderdale International Boat Show related happenings.